Again, it is the 1 3/4" Brakes as used on some 6 cylinders, Small V8's, Check your Brake Size by Measuring Across the Shoe Width, NOT THE DRUM. Don't know what you got???? call. 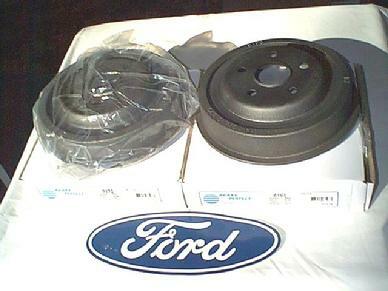 These will fit/Function correctly on all 5 Bolt Wheel Mustang Cougar Fairlane Comet Falcon Torino Montego Comet from 1963 to 1972. Shipping is estimated for all areas. If you want a Exact cost, Please write, or Call. 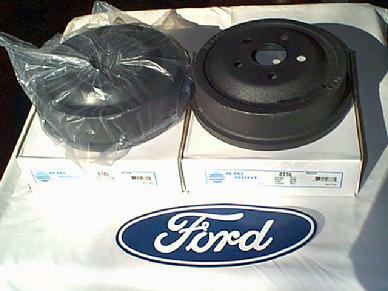 These are 10" REAR Brake Drums for the 2" Brakes. Again, it is the 2" Brakes as used on All Big Blocks, Performance Cars, etc, Check your Brake Size by Measuring Across the Shoe Width, NOT THE DRUM. 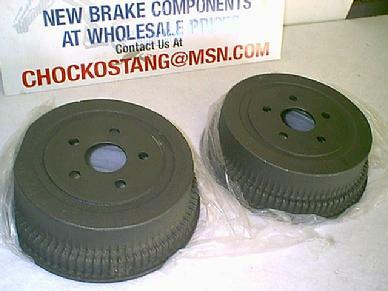 These will fit/Function correctly on all 5 Bolt Wheel Mustang Cougar from 1963 to 1973. Fit all 2' thru 2 1/2" Front Brakes. All 1963 to 1971 Fairlane Falcon Comet Torino Cyclone.